BRADFORDS Bakers, one of Glasgow’s best-known and oldest family firms, has launched its delicious range of Mother’s Day handmade gifts. In addition to a miniature teddy bear and ‘mum’ cupcake, the range includes: afternoon tea in a beautiful gift box; a delicious cupcake selection, available individually or in boxes of four, six or more; assorted cakes and biscuits in a keepsake box comprising individual cakes for mum, mummy or gran with a personalised inscription on a handmade Madeira sponge cake that serves four people and a fresh flower basket. 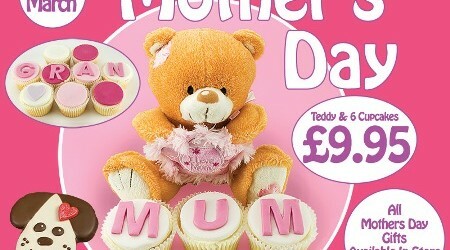 Claire Bradford said: “In addition to these Mother’s Day gift sets, all our cakes and biscuits are available to buy individually – and this year customers can add a teddy bear, balloon or fresh flowers to complement their gift! Bradfords’ Mother’s Day gifts are all available to buy or order now at its branches in Giffnock, Pollokshaws, Eaglesham, Merrylee, Newton Mearns, Clarkston, Neilston, Clarence Drive, Sauchiehall Street, East Kilbride, Milngavie, Crow Road and Troon. Founded in the south side of Glasgow in 1924, Bradfords Bakers remains a family owned and operated business with support from skilled staff still baking traditional hand crafted products.